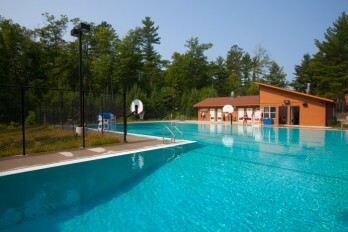 As you take a walk through Camp, it is easy to feel a lot of pride in our facilities. Much of the facility is over 50 years old, and we have made incredible efforts to implement capital improvements over the last 10 years. Click here to view our Interactive Map or view our Virtual Tour. Our public programmatic buildings all have multiple purposes and are designed to enhance and deliver exceptional programming to our Campers. As you walk down the hill into Camp, you first will see The Grossman Family Ropes/Challenge Course: an eight element high ropes individual challenge course and an eight element low ropes team initiative course. Additionally, you will see a two sided climbing tower to enhance campers’ personal challenges on the ropes course. Next you will see the Daniel M. Soref Aquatic Center that was built in 2012. Our heated pool and washhouse facility has provided the opportunity to expand our American Red Cross instructional swim program, enhance our lifeguard training opportunities, and deliver super fun pool parties! Across from the pool, you will be amazed when you walk into our theater, the Brenda Friedman Ulam, renovated in 2006. This large, indoor multi-purpose room is where our talented campers put on theatrical productions and perform other activities. Our state of the art sound and lighting allow campers to learn how to operate a sound and light booth and develop skills on the technical side of theater as well. Continuing down the road, you can’t miss our Athletic Field, which is a hustling, bustling place in camp. Many of our sporting activities take place here from Basketball, Diamond Sports, Sand Volleyball, Gaga, archery, and we can’t forget Tushball. 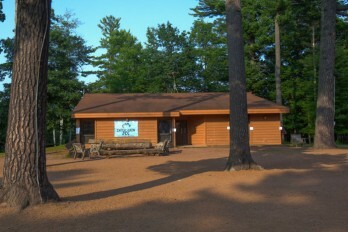 Next to the athletic field sits the Zucker Family Mirpesset (porch), built in 2012. Located right in the middle of camp, our covered Picnic Pavillion is where you can find staff and campers hanging out, writing letters home, enjoying nosh from our Canteen, picking up their mail and packages from the Mail Room, and enjoying each other’s company. This is a space that we have no idea how we ever lived without. 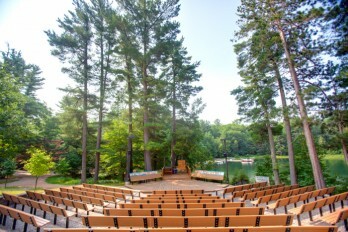 Makom HaLev, place of the heart, houses our amphitheater and was renovated in 2013. With its ideal waterfront location, the Makom HaLev is a wonderful place for the campers to gather together, sing songs and celebrate being Jewish during Shabbat services. Just above our amphitheater sits the Kennedy Barnett Judaic Resource Center, which was built in 2008. This space is the hub of all of Camp’s creativity, with a home for the Song Leaders, a space dedicated to “programming central,” a beautiful work space for our Judaic Educator, and more! 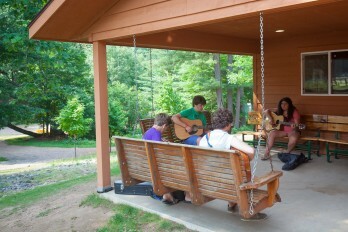 The porch swings are one of the most popular places in Camp to do a Cabin Program, hang out with your friends, or jam with some song leaders. Three kosher and peanut/tree-nut free meals day are enjoyed each day by all of our campers and staff in the Lorraine & Morry Mitz Family Chadar Ochel Dining Hall. 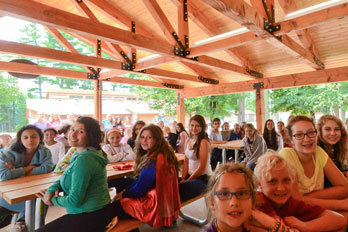 The Dining Hall is a loud and happy place where the entire Camp comes together as community. 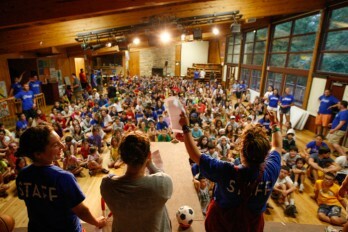 After each meal, vibrant and lively song sessions fill the building and showcase the amazing ruach that is deep within our campers and staff. The Weinberg Judaic Resource Center is a building that we lovingly call the Beit Am, house of people. This is our creative arts center that houses the Omanut (art room), ceramics studio with 3 pottery wheels and a kiln, photo & video room, sifria (library), nature room, and more. 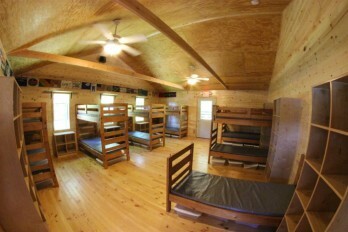 The cabins make up a huge part of Camp Interlaken. With 18 Cabins and 6 Yurts in K’far Noar, the Teen Village, a camper’s cabin represents their bedroom. 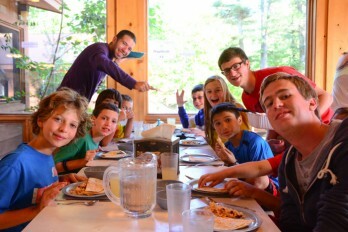 Boys and girls live in separate cabins under the supervision of our counselors. 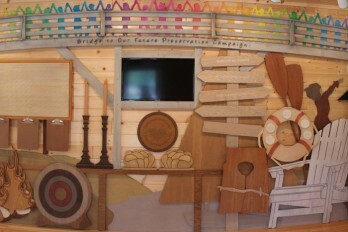 Each cabin has a Hebrew name representing one of the 10 tribes, matriarchs or patriarchs, which further enriches the camper’s Jewish experience. Additionally, Camp has a few Administrative buildings including the Zucker Family Welcome Center which houses our administrative offices, beautiful Donor Wall recognizing our donors, and welcome center for guests. The fully equipped Weinberg Health Center is where you can find our physician-in-residence, state-certified nurses and nursing assistant. Complete hospital and specialist facilities are located just minutes away from Camp. 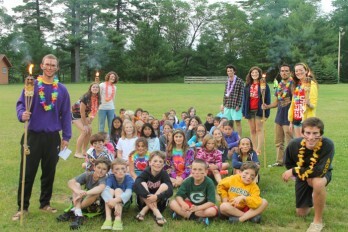 Lastly, the highlight and gem of Camp Interlaken is Lake Finley. 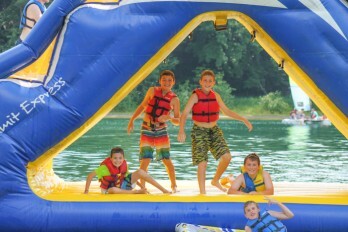 On the 125 acre lake campers waterski, sail, windsurf, hydrobike, paddleboard, canoe, kayak, fish, climb our inflatable climbing wall, swing on our rope swing, jump on our Rave trampoline, walk on our water-mats, and swim in our crystal clear swimming area. Campers love celebrating Yom Ha Finley, Day of Lake Finley, and campers love having the opportunity to both swim in a lake and in our heated pool.